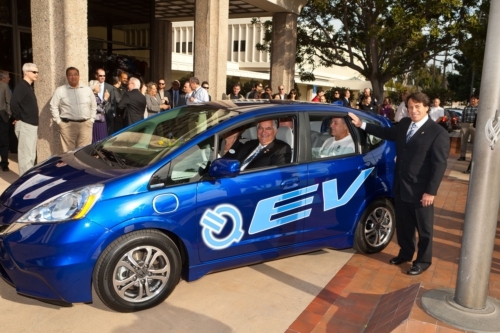 Electric compact unveiled in California. Honda delivered a 2013 Fit EV battery-electric vehicle to the city of Torrance today as one of the first major steps in the Honda Electric Vehicle Demonstration Program, a prelude to the retail market launch of the Fit EV with customers in California and Oregon this summer. As part of the Honda Electric Vehicle Demonstration Program, Honda will test the Fit EV with Google Inc. and Stanford University, in addition to the City of Torrance, California. Each program participant will provide Honda with real-world feedback on the Fit EV. Individually, each participant will use the Fit EV to further initiatives such as research into human behavior and various usages like personal, fleet and car-sharing.